We are re-publishing this art exhibition review to mark World Mental Health Day 2018, a World Health Organisation initiative, this year focused on Young People and Mental Health in a Changing World. 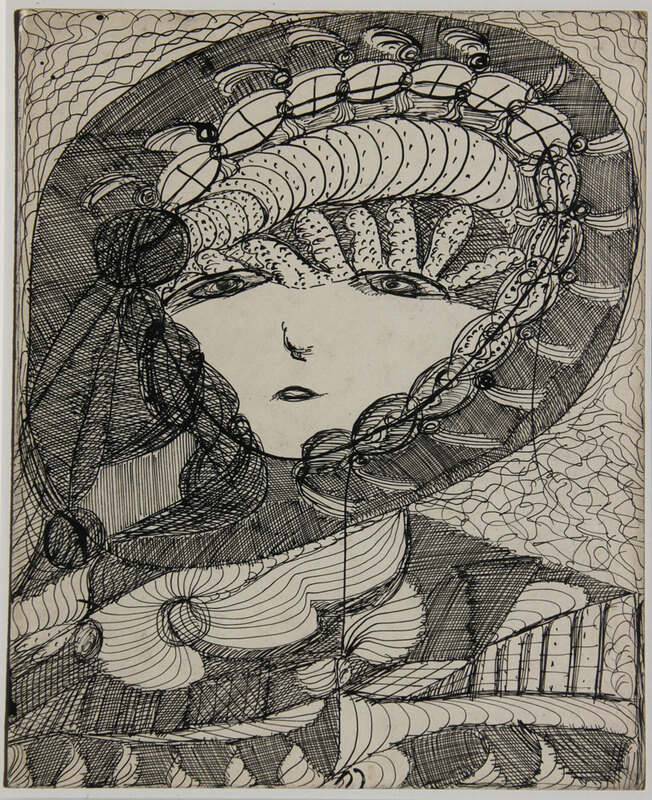 Madge Gill: Medium and Visionary at Orleans House Gallery was reviewed and first published on The Fine Line Project website to mark World Mental Health Day in 2013. We are progressively transferring content from that site onto Armadillo Central, specifically where it relates to the arts, as part of our commitment to spreading the word and the conversation about mental health. To mark today’s World Mental Health Day, which focuses this year (editor’s note: in 2013) on older adults, we’re posting a review of last night’s opening of Madge Gill: Medium and Visionary at Orleans House Gallery in Twickenham. This exhibition brings together some 100 artworks together with supporting documents and photographs providing the most comprehensive overview of Gill’s work to date. Further information is supplied in an excellent catalogue compiled and edited by Mark de Novellis, who has curated this fascinating show alongside Henry Boxer, Roger Cardinal and Vivienne Roberts, all of whom have contributed to the publication. 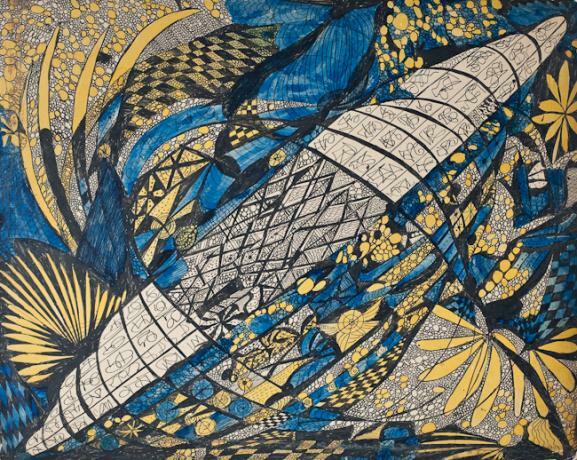 From 1919 Gill produced works in various media, including knitting, embroidery, rug-making, and drawing in inks – this last proving her richest vein and being the main focus for the exhibition. Her output was achieved over a forty year period, with the most prolific phase taking place in the 1950s. It is fitting to start with Madge Gill’s own words: “It was in 1919 when I first started my work. 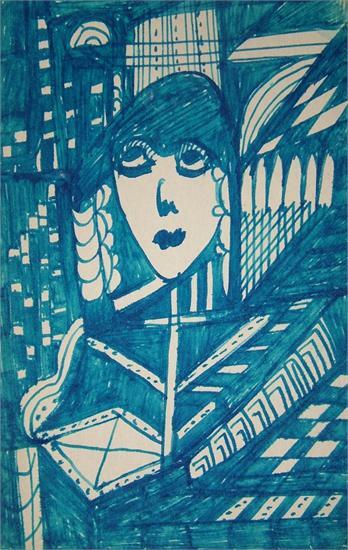 I then had an inspiration to take up my pen and do all kinds of works of an artistic type. I felt that I had an artistic faculty seeking expression. It took various forms. First of all, knitting – even without any pattern. Then came a flow of all kinds of inspirational writing, mostly Biblical. Then I felt impelled to execute drawings on a large scale on calico. I simply couldn’t leave it and I did on average 20 pictures a week, all in colour. All the time I was in quite a normal state of mind and there was no suggestion of a ‘spirit’ standing beside me. I simply felt inspired. Sometimes I would be dissatisfied with the work and tear it up or burn it. But I felt I was definitely guided by an unseen force, though I could not say what its actual nature was. “ Extract from an interview in Prediction Magazine, 1937. 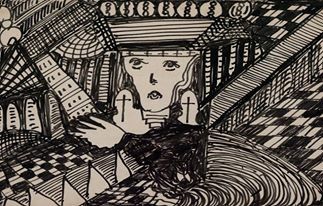 For Outsider artists more often than not the creative process is an internal exploration. 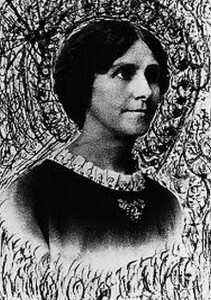 Gill later spoke of hearing voices throughout her life and of the spirit which propelled her creative urges, known as Myrninerest. 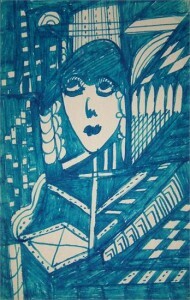 Most of her artwork is unsigned but where it is marked, credit is given solely to her spirit guide. She refused to sell her pieces on the basis that the work didn’t belong to her but to Myrninerest. 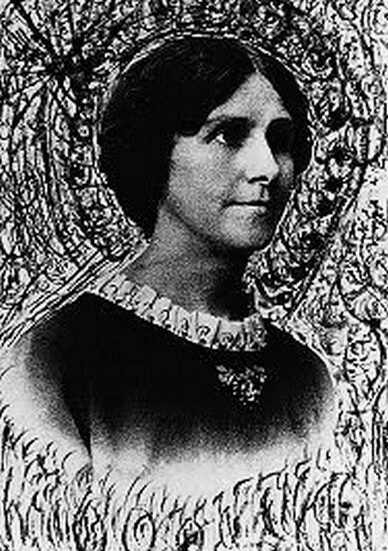 There is evidence that she was known as a psychic and medium, certainly a visionary in some respects. It has also been suggested that she may have been schizophrenic but no diagnosis was made. She did have a spell in the Lady Chichester Hospital for Women and Children in Hove, an establishment focused on the ‘borderland’ between wellness and ill health, more specifically mental health. Certainly her life, both the traumatic early years and the periods surrounding the stillbirth of her daughter and the death of one of her sons at the age of 8 would suggest that she suffered from depression. Her family as an adult however seemed to accept her as she was, this despite a strained relationship with her husband. In later life her sons supported her and embraced their mother’s strange and often compulsive behaviour, enabling her to continue to produce work until she died in her seventies. By that time she had amassed a couple of thousand artworks, with over 1200 bequeathed by her son Laurie to their local East Ham County Borough Council, now looked after by the London Borough of Newham. Many of these works have been included in this exhibition. Speaking at the exhibition opening Cardinal suggested that the presence of a spiritual guide in Gill’s life might have provided the permission she needed to give herself to dedicate most of her time to her art: “She was minded to do it,” he said. He also points out that “Gill’s craftsmanship is characterised by dogged perseverance.” Later on she worked on rolls on canvas that she had no hope of viewing in full in the small room that she worked in at home. At this stage she agreed to exhibit her work publicly perhaps with the sole aim of seeing these large pieces in their entirety. One of these, a monumental pen and ink work on calico entitled The Crucifixion of The Soul, measures 11 metres and is displayed in the Orleans House show. What shines through in this inspiring, extensive yet intimate exhibition, is Gill’s unstinting dedication to making her mark, her obsessive attention to detail and her almost unerring need to cover every centimetre of the surface. A proliferation of faces, watchful eyes, geometric shapes and intense surface decoration permeates almost all the works – a veritable outpouring of creativity. 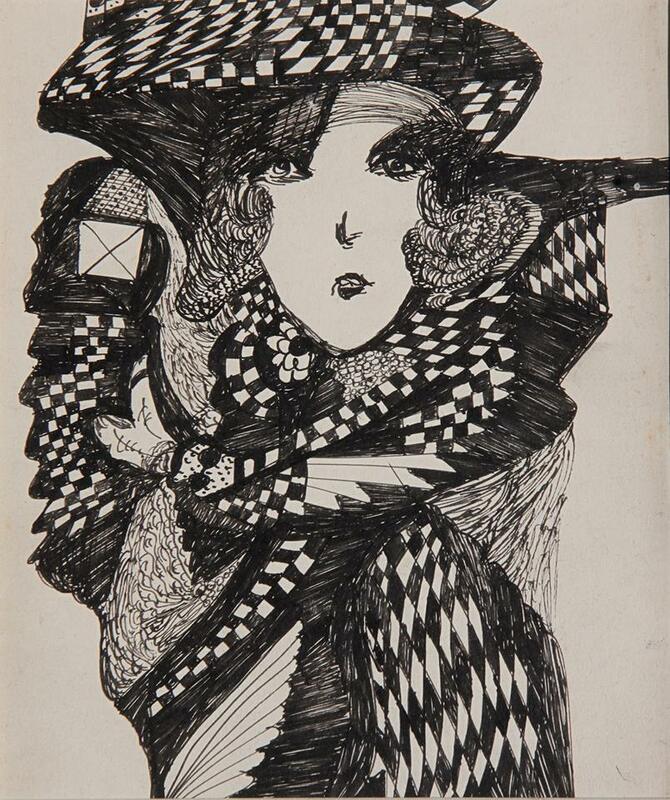 There is a good cross section of monochrome works interspersed with many of her sensitively coloured pieces, displays of her postcards, found in numerous boxes under her bed following her death. The attic and virtually other rooms held more caches. The arts team at Richmond Upon Thames Borough and the co-curators have created an extraordinary testament to this extraordinary woman. 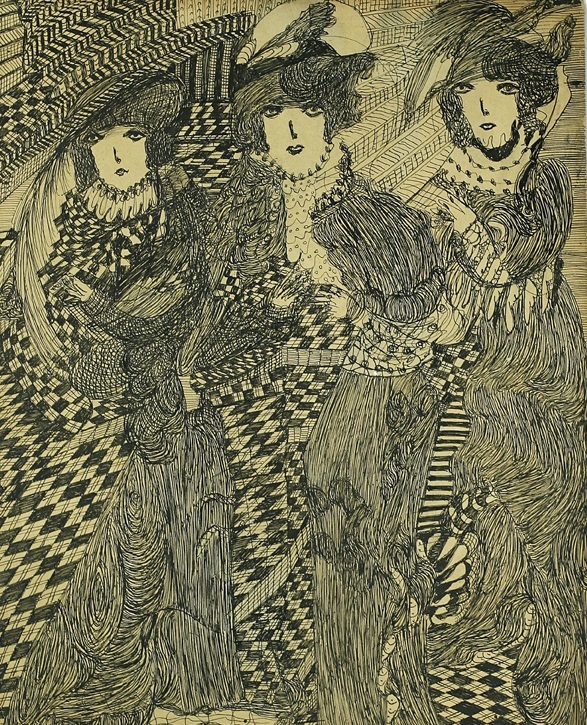 Thanks to a grant from the Wellcome Trust, the Orleans House Gallery exhibition and accompanying catalogue has also enabled new multi-disciplinary research into Madge Gill’s creativity via a team which includes Dr Paul Camic, Professor of Psychology and Public Health and mental health historian Dr Rob Ellis. This brings us neatly to another constructive spin off afforded by the Madge Gill retrospective: Richmond Borough’s Art & Soul Project. Members of this already well-established group have been working on their own pieces, informed and inspired by Gill’s artwork. A section of the space at Orleans House Gallery displays some of their exciting new work. This member led organisation aims to provide a positive framework in which people with mental health issues can express themselves, develop new skills and make a positive contribution using active participation and the group experience to give many a needed boost in self-confidence and self worth during difficult periods in their lives. One might suggest that first and foremost though participation in the project offers a chance for self-expression and creativity, a compelling sometimes healing life force which Gill’s outstanding and extensive oeuvre amply illustrates. 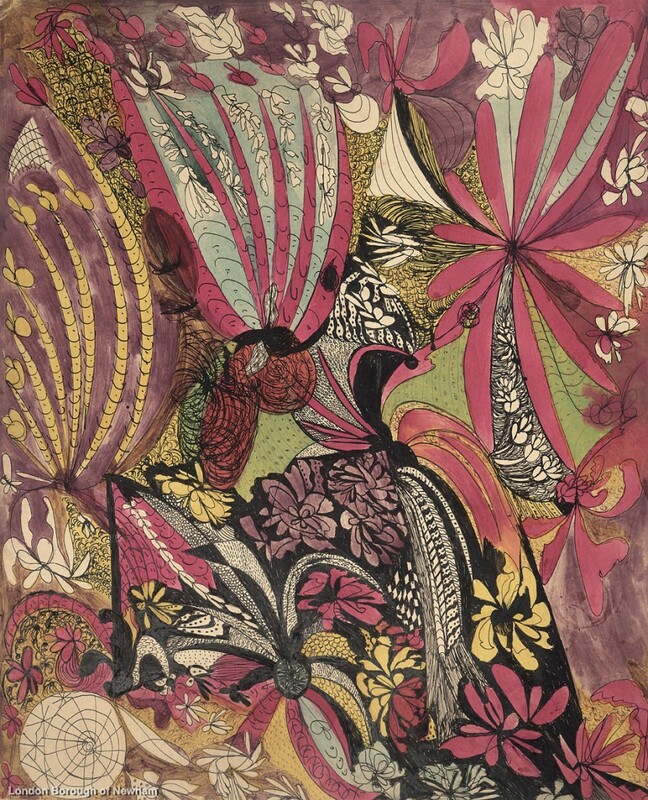 Pictures courtesy of / © : London Borough of Newham Heritage and Archives; Musée de l’Art Brut, Lausanne; Henry Boxer Gallery; De Novellis Collection. 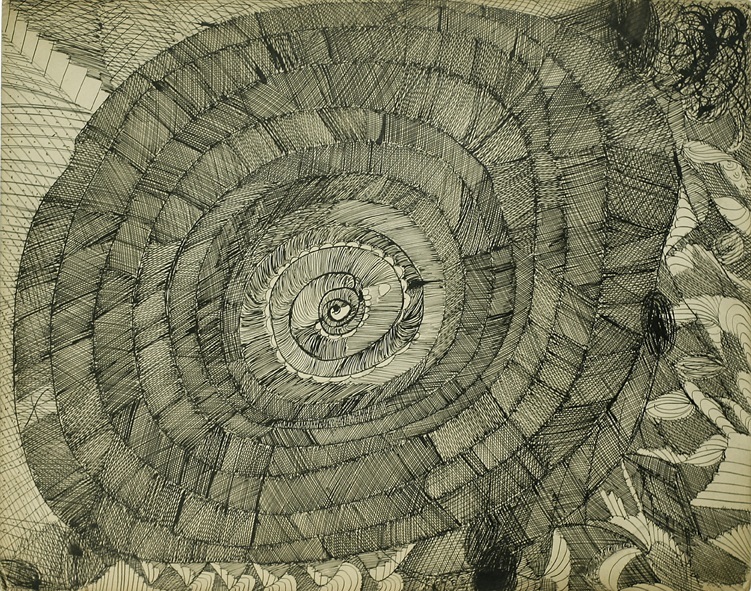 Madge Gill: Medium & Visionary ran until the 26th January 2014 at Orleans House Gallery, Riverside, Twickenham, TW1 3DJ.